Set in London in the 1950s, a portrait of a charismatic and narcissistic middle-aged dress designer, and the story of his encounter with a young waitress who takes up with him. Reynolds Woodcock (Daniel Day-Lewis) has made it. He’s an influential dress designer and serves the wealthy, the powerful and the royal. Relentless and obsessive, he is haunted by the memory of his mother and watched over closely by his sister. Continuously by contingently involved with women, he never seems to fall until he encounters Alma (Vicky Krieps), a waitress, by chance. He immediately takes her on and brings her into his profession and his life which she, in her own crafty and considered ways, is determined to navigate. Paul Thomas Anderson makes big films about guys with big egos and seems to get away with it much of the time. His overwrought There Will Be Blood (2007) staring Daniel Day-Lewis was critically well received, and his more subtly crafted The Master (2012) starring the late Philip Seymour Hoffman, based on the life of L. Ron Hubbard the founder of Scientology, made a big splash as well. Anderson seems fascinated by powerful narcissists and determined to use all the means at his disposal to convey an intimate sense of who they are and how they operate. Here, the classic portrait of the the narcissistic anti-hero is intruded upon by love, which is Anderson’s narrative ploy to call the ego out onto the carpet in some way. The film devotes itself to the portrayal of the absolutely perfectionistic and irritable Woodcock as a kind of heroic figure. As well, however, Alma comes on the scene, invited unexpectedly by Woodcock, and her determination to follow through on love, with whatever egregious and sly means are at her disposal, forms the basis of the drama. It’s an interesting ploy in a way, but there is something so patently ridiculous and overblown about much of the portrayals that it’s hard not to think that Anderson has his tongue poking through his cheek much of the time. That is indeed a big question because Anderson seems on the surface to be taking himself and his narrative extremely seriously most of the time. Much of the audience I saw the film with was chortling heartily by the end of the film and it’s not because there were lots of comic lines. Either Anderson has produced a kind of new genus of film – the completely self-satirizing drama that effortlessly calls up ironic responses because of its innately overblown nature – or he has created an intriguing but blundering attempt at deep character portrayal. 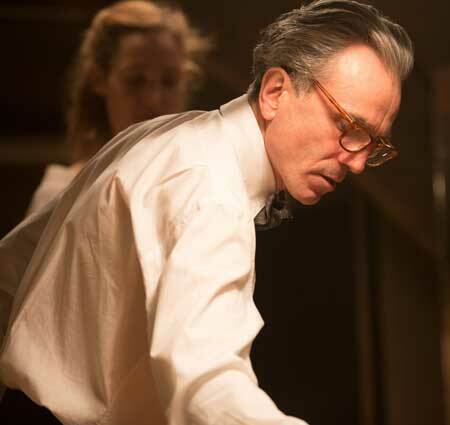 Daniel Day-Lewis is indeed a deeply affecting actor. It is somewhat sad to think that his avowal of going into retirement after this film is true. It seems not enough of a finishing act to do justice to his career. He does a reasonable job here, given the unbearable weightiness of the role and the heaviness with which the script treats it. The character, because of Anderson’s focus on narcissism and Day-Lewis’ great capacity to convey the completely enveloped self, is indeed compelling in many ways. The love story is kind of interesting, given the idea that the waitress, unexpectedly chosen out of the blue, turns out to be a quite determined and self-possessed young woman. The whole portrayal, of relation of powerful man to subservient woman, is so poignantly relevant in light of what has just been coming to light lately about goings on in Hollywood and everywhere else that the scenes are frequently painful to watch. The idea that sincere love, faced with an unrelenting ego, needs to become aggressive and perhaps destructive in order to gain the upper hand, is indeed an interesting one. Anderson floats the idea here as a kind of mysterious thriller element rather than exploring it deeply, but the gesture is worthy of note. The Devil Wears Prada (2006), featuring Meryl Streep, about a woman who is a fashion magazine power broker, rigid and manipulative, is indeed an effective dramatic comedy based on a similar theme. It takes itself less seriously but gets its point across nevertheless. 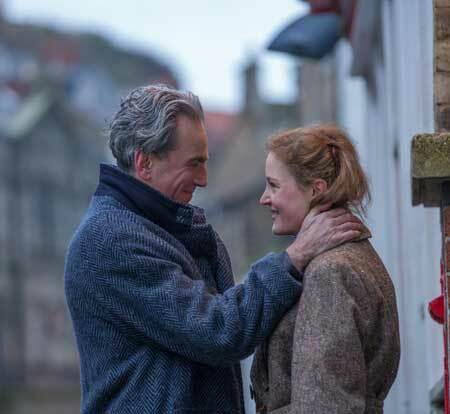 Phantom Thread is more like a trek through a dire narcissistic tundra plagued by frost and long silences; it carries weight, but not delicately nor with any degree of wryness or humor, unless, in some indirect way, that’s what this writer-director intends through some attempt at dramatic kitsch. Nonetheless, the subject-matter is timely and significant, and Anderson’s attempt to portray and deal with this condition, here and in other films, is worthy of note.